Central Air Conditioning - How Does it Work? Did you know that about 87 percent of American homes have some form of air conditioning, according to the Energy Information Administration? If you live in Florida, humidity and extremely hot temperatures are definitely your enemies! It is a struggle to go outside without having to bounce from your air-conditioned home to your air-conditioned office. An efficient heating, ventilating and air-conditioning (HVAC) system is vital for the comfort of your family throughout the seasons of the year. You often take this climate control device for granted but when it stops working, you will start panicking. Don’t let your comfortable home turn into a sauna! To better understand how you get cooled air, it helps to know about the components that are part of your AC system. 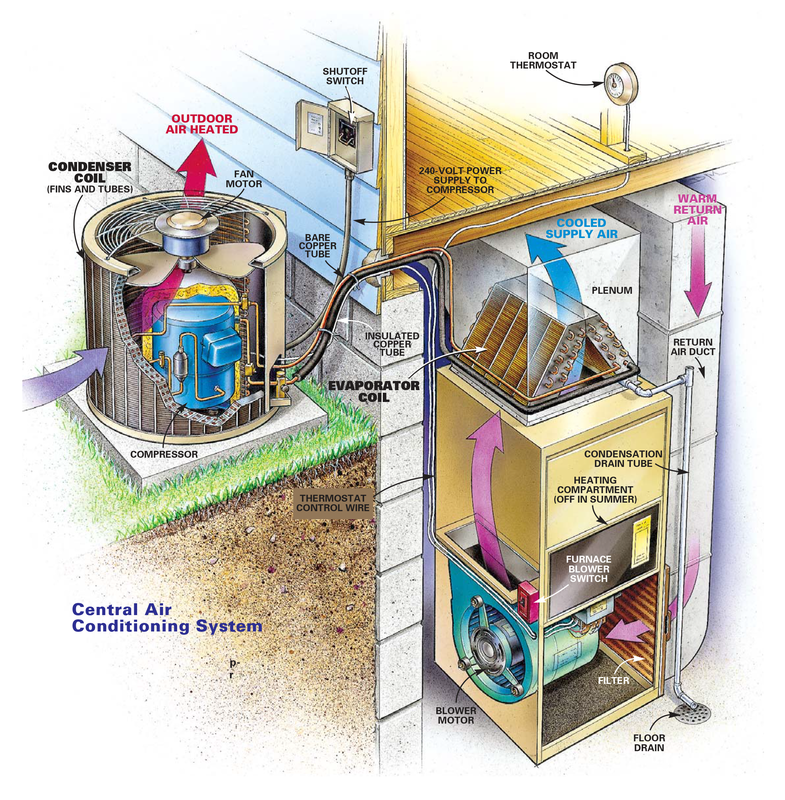 A typical central air conditioner is a split system consisting of an outdoor and indoor unit. Let’s explore what these units include. Thermostat: The most visible part of your HVAC system, usually placed on a wall. Homeowners use this device to manipulate the temperature within their homes. You can program it in advance or set your desired temperature manually. Heat Exchanger and Furnace: The heat exchanger activates the furnace. It is the component that exchanges hot air with cold, then distributes it through the piping system and ducts within your home. The furnace, usually placed in a special closet, heats a supply of air through electric resistance, heat pumps, solar energy or combustion and distributes it to the rooms in your house. Evaporator Coil: It is usually installed on top of the gas furnace inside your home. This is what cools down air when you set your thermostat on lower temperatures. It cools and evaporates liquid received from the condensing unit. Ducts and Vents: Ducts transport warmed or cooled air to the various areas of your home. Vents are the outlets that help distribute air from ducts to individual rooms within your home. They are located near the ceiling. unit and also distribute it into the evaporator coil for cooling. Condensing Unit : This outdoor unit is filled with refrigerant gas. When the refrigerant is cooled off to a liquid, the condensing unit pumps it to the evaporator coil to be turned into gas again for distribution. When you control your thermostat and set it to a lower temperature, a whole process begins. The refrigerant is a cooling fluid that is present in the refrigerant lines outside of your home and that uses electrical power as its source. The evaporator allows the refrigerant to absorb the heat coming from the inside of your house and evaporate. The vapor then travels to the outdoor compressor and then to the outdoor coil, known as the condenser. As the refrigerant passes through the condenser, a fan delivers ambient air across the condenser coil, causing it to cool. This cooler air is then pushed through the ducts into the vents, finally reaching the rooms in your house and causing the temperature to drop. This cycle of dispersing the indoor air to the outside and pumping the refrigerant back to the inside keeps repeating, making your home cooler at the temperature you select. An efficient air conditioning system provides indoor comfort during warm weather, helps keep your home cool and reduces humidity levels. The indoor and outdoor units work in a repetitive mechanism of refrigerant loops where the heat coming from the inside of your house is absorbed and then dispersed to the outside. 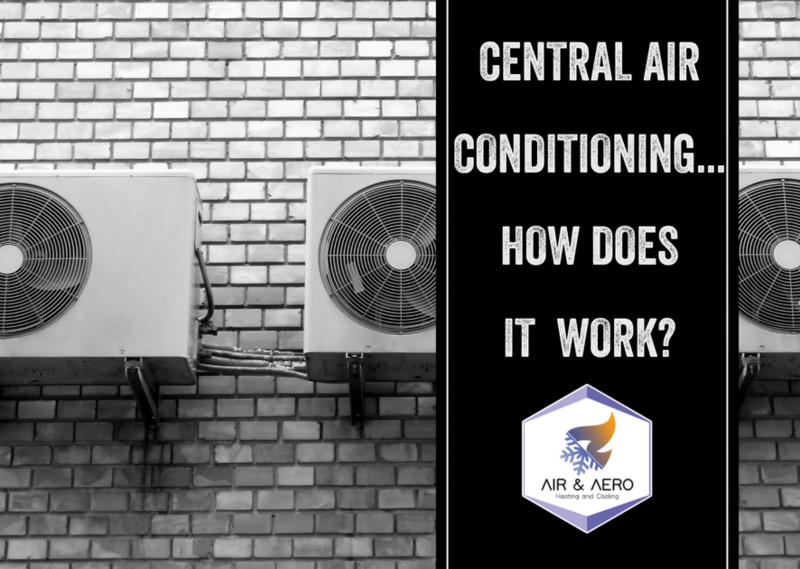 Knowing the components of such an important system helps you better understand the process of central air conditioning systems. Maintaining your HVAC and preventing any malfunctions or repairs is crucial to the comfort of your family and home! Our experienced team is dedicated to helping you enjoy excellent home comfort, regardless of the season or temperature it might be outside. You can find out more about all your heating and cooling needs by visiting our website or by taking a look through our additional blog articles for tips and industry information on the latest cooling technology. 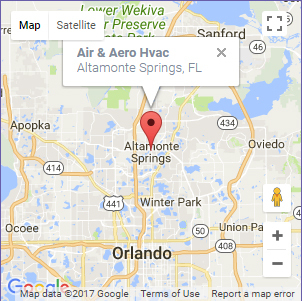 Call Air & Aero Heating and Cooling today at 407-710-7168 or email at contact@airaerohvac.com to schedule an appointment. Central Air Conditioning – How Does it Work? Considering Ductless Air Conditioning? Here’s What You Need to Know!